1. Do I need a website? It seems like a weird question, but this should be the beginning of your journey. And the reason why most websites die within a few weeks. If you have a small business (or any business) the question will be ‘yes’. No matter how small, your own online presence will be a good thing. If you want a personal site, the question is probably ‘no’. I would recommend to first try a free service and see if you can keep up. But most likely after using social media an own site might seem like too much. Be happy with the fact that nobody will visit your website, outside of your family and maybe some friends ( and they will lie about it too! ) . 2. Which information do I have to offer? Closely related to question 1: What kind of information I have to offer that isn’t already widely available everywhere else? In case of your business I would keep it simple. What do we do, what products do we offer, where are we located and when are we open? It’s incredible that some very small companies will go through the trouble of creating a huge website, online ordering and payments, and forget to mention where in the world they are located and when the real-life counterpart is open. 3. How ofter can I update? That brings you to maybe to most important question. Do you really have time to sit down every few days and update your website? Most websites die in the sea of ambition. Before starting there are a zillion ideas. ‘Let’s maintain this open directory of everything that is happening in my city!’ . If a site is out-of-date people will click away instantly. There is nothing wrong with not having a blog if you won’t write on it. If you only have to offer static information, fine. That’s a lot better than knowing the special offers of 2008. When starting out with your online presence it doesn’t have to be perfect. You don’t need to have all . It much more important to do a few things good, then a lot of things bad. There are many companies, people and websites around that will try to convince you of the latter. Especially of course when they smell a lot of work. This is how most of us work: we just take a stack of paper ( yes, no fancy tools ) and a pencil and just write down a list of must-have content. And then we make a few sketches ( if you are a web 2.0 windbag you can call it mood-boarding ) and see what works and what not. Sit down for an evening and settle yourself in front of the computer and start browsing. Learn yourself to consciously think about what you are seeing on other pages. For instance what do you feel? Chaotic blinking stuff or a sober layout? Nice fonts? Too small or too big? Are the links on the place you’d expect? Do you find your thoughts drifting off from what you are searching here? Or can you find everything quickly? 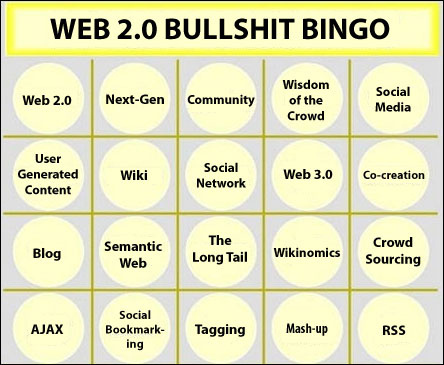 You can play site-bingo. Take the subjects from this post and collect sites who do them right or wrong or just a few of them right. This way you will teach yourself. Recognizing good ideas and bad ideas will help you tremendously with your own work. Stack this with your design on the wall and never forget. And lastly, (almost) nobody’s getting millionaire next week from putting a site online. If you know how to do this, you wouldn’t be reading this.